It's actually beautiful and would probably 'mix' well with your other plants at the balcony. Meet Electree+, the solar powered multipurpose charger. Communication tools like hand phones come to mind. Its leaves might not be green, but its potential for energy efficiency most certainly is. This little mock bonsai tree might look like the kind of thing that just sits prettily on top of a coffee table, but it is actually a rather ornate phone charger. The Electree+ doubles as both an ornament and a charger for everyday electrical devices - without the need for any delicate pruning. 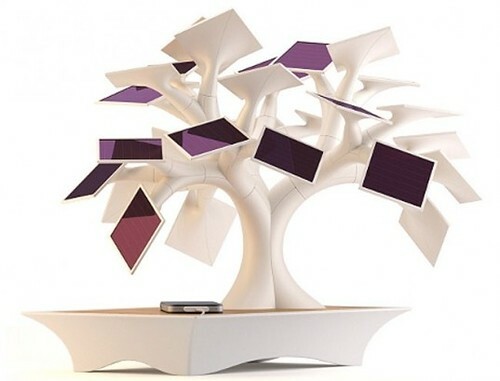 The device has 27 miniature silicon solar panels - or 'leaves', as they are called - that can be arranged in any way the owner wants to create their own bespoke tree. The base of the gadget conceals a battery that stores the solar energy. At full capacity it can hold enough power to charge an iPad twice and can charge a phone in just four hours. With energy costs soaring, the gadget has been designed to help technology-geeks charge their phone in a green-friendly manner. Created by French designer Vivien Muller, the Electree+ conceals a USB connection underneath its wood-topped base unit. The designer said he was inspired to make the product after observing real trees, noticing that their leaves acted as natural solar panels. The designer is waiting to receive 400 presale orders for the product before commencing production. Bonsai is a traditional Japanese art form in which trees are grown in miniature pots. But while the gadget may cut down on your energy bills, it might take you a while to recoup the savings, as it will costs £283. would be a neat idea if improved in both quality and cost. I think they should paint the 'leaves' green or something. Or less white, then the bonsai can blend with the real plants outside the house. See how I am making over $75,000 month after month online Click Here.